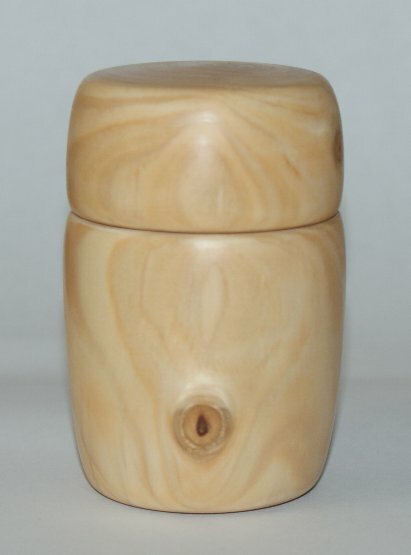 A small pot, made from a piece of cypress, finished with wood turning polish. 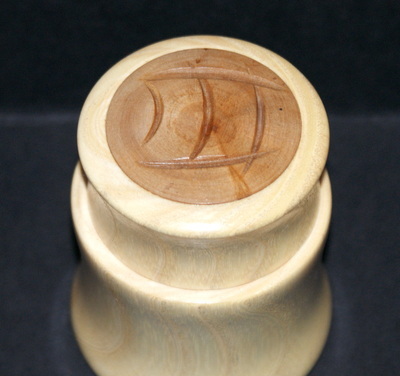 Extra detail has been added in the form of a dark ring around the box, this is made by holding a piece of wood onto the box whilst it's spinning at high speed on the lathe, friction causes the wood to discolour as it heats up. Leyland Cypress pot with lid. This small pot with lid is made from a piece of Leyland Cypress (Leylandii) it's the first thing I made with a load of wood I rescued from the bonfire. This type of wood may not be to everyone's liking, but I find it to be quite nice in terms of grain patterns, and it's very good for polishing to a high shine. A small pot shaped like an egg in an egg cup. Designed to be used as a memory / keep sake box, these boxes are used to store a memory or memories, like a photo from a favourite place, or a lock of your first child's hair. Small Cypress pot with lid. This small pot is made from a piece of Cypress, and finished with wood turning polish. 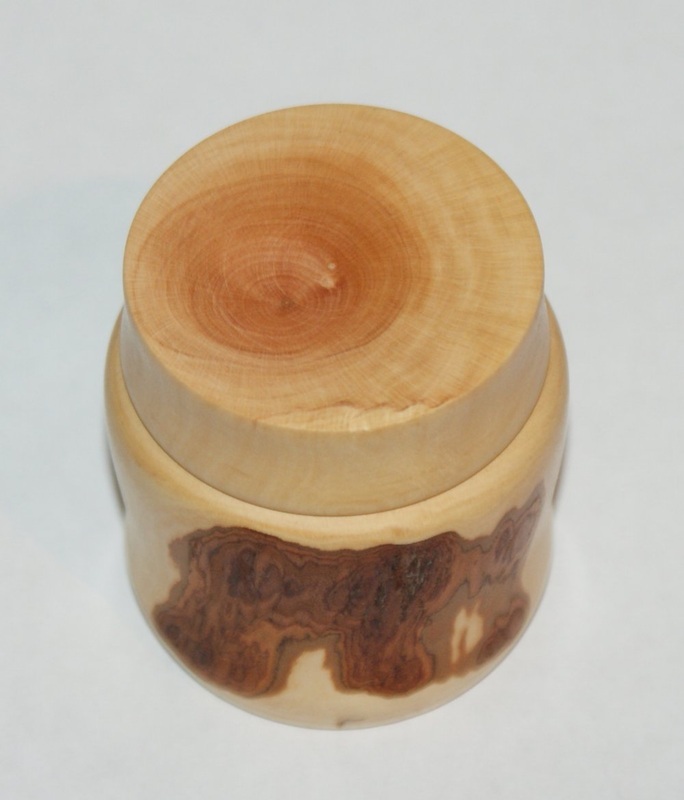 The patterns and grain in the wood give this small pot an almost marble like look. 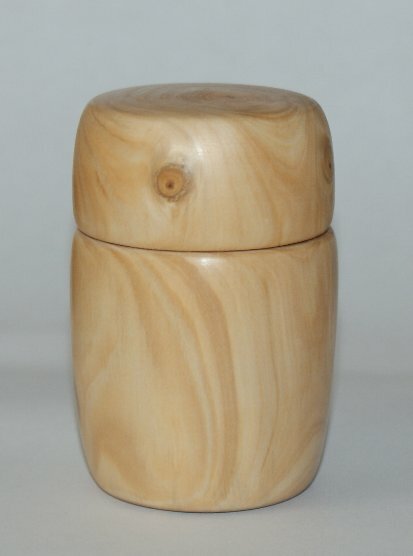 Designed to be used as a memory / keep sake pot, these boxes are used to store a memory or memories, like a photo from a favourite place, or a lock of your first child's hair. 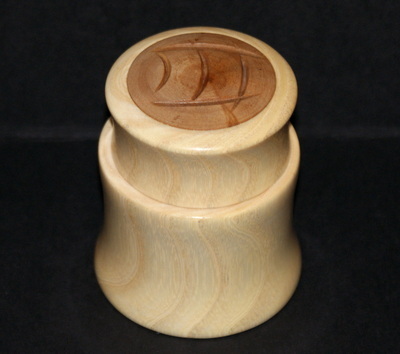 a nice little addition to any shelf or desk, who's knows what secrets these little pots and boxes might hold ? 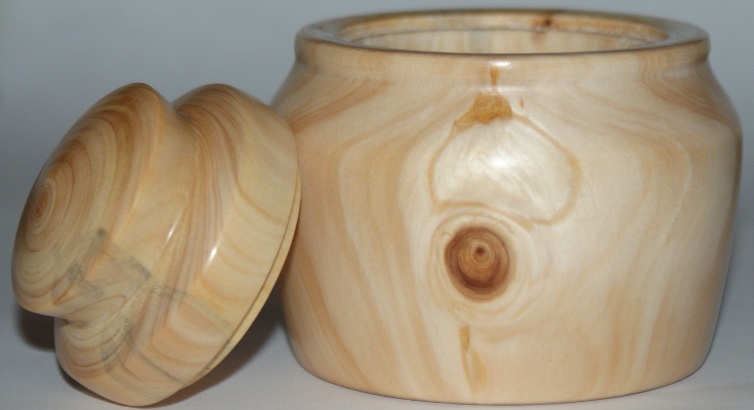 A small and simple pot made from a piece of Leyland Cypress (Leylandii) and polished with turners polish and finished with a hard wearing wax. 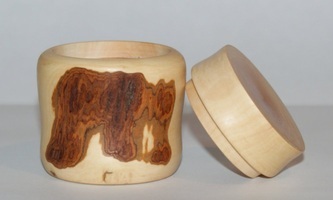 Small Cypress Pot with bark. 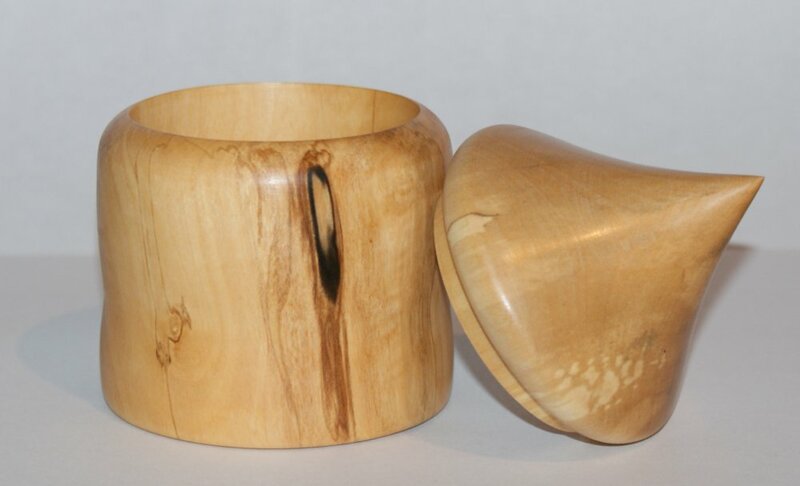 This small pot is made from a piece of Cypress, some bark has been left on to give the pot a more natural feel then finished with wood turning polish. 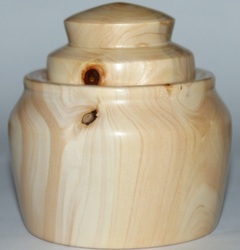 A medium sized pot made from a single piece of Cherry, with a slight twist design on the lid and base. It's believed that cherry wood is thought to keep evil spirits away, and the Chinese place cherry branches above their doors on New Year's Day and carved cherry wood statues to stand guard in front of their homes. Finished with turners polish for a subtle shine on the outside, and a natural wax on the inside. A great addition to any shelf or desk, or anywhere else a small pot for storing things is needed. This Silver Birch pot is made from one piece of wood, and finished using a wood turning polish to give it a nice shine. Birch is known to be the tree of Venus, it has a number of properties associated with it. Birch is believed to protect against evil spirits and the evil eye but it also symbolises love and fertility. In medieval times, a bundle of birch twigs was carried by the local magistrate on his way to court as a symbol of his authority and as a means of correction. The use of the birch as a punishment probably originates in the need to drive out evil spirits. Collection Of Four Walnut Pots. Collection of four handmade wooden pots,each one is made from a different type of Walnut wood,the darker pots are made from older wood,whilst the lighter pots are made from younger wood,all four pots have been given a coat of clear sealer. Sizes range from approx 10cm in heght down to approx 5cm in height. Ash pot with Pear wood inlaid top. 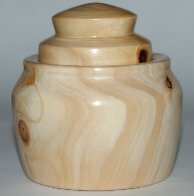 Small pot with lid,made from Ash with a Pear wood inlay in the lid,the Pear wood inlay has a unique line design. The darker Pear wood adds a nice contrast to the light coloured wood of the Ash. Pear wood pot with spiral design. 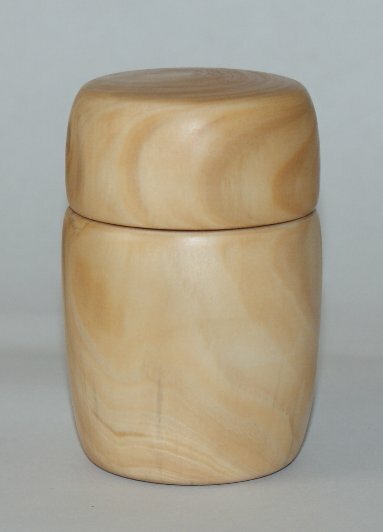 Pear wood pot,with hand carved loose spiral design.The Pear is seen as a female symbol in many cultures, for example in Greek and Roman mythology the Pear is attributed to three goddesses, those being Hera (Juno to the Romans), Aphrodite (Venus to the Romans), and Pomona, a Roman goddess of gardens and trees.